For a thousand years British people have been battling against the 'Trespassers will be Prosecuted' mentality of landowners. Now, however, the law of trespass is under challenge. After mass trespasses and days of protest against 'Forbidden Britain,' the idea of a right of access to Britain's countryside has moved firmly on to the political agenda. But any such 'right to roam' will be fiercely resisted by some. What would it really mean for agriculture, forestry and wildlife, as well as recreation? Who would benefit and who would lose out? This illuminating book answers these questions and places them in what turns out to be a fascinating historical, philosophical, and political context. The result provides essential reading for anyone concerned about the balance of power in a changing Britain as well as the fate of our countryside. The Theft of the Countryside, Marion Shoard was dubbed the `Rachel Carson of the British conservation movement'. She is a frequent contributor to The Times. 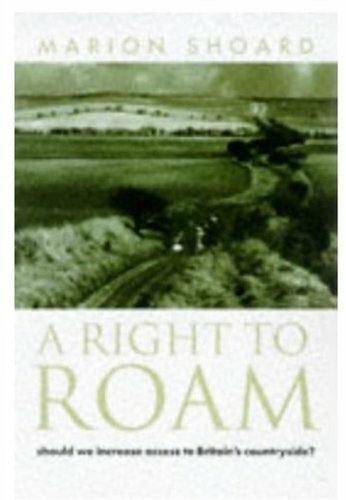 "A Right to Roam" is essential reading for countryside planners. This well-researched, fascinating and easy-to-read book looks at the history of land ownership.." --Planning. No date given on review.